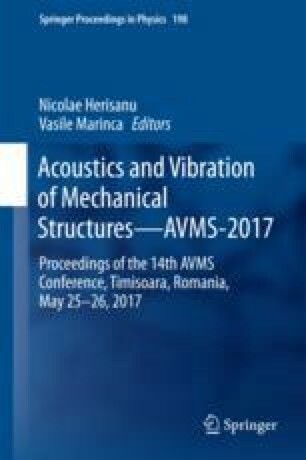 This study deals with operational modal identification techniques area, presenting a group of experimental and computational approaches about refining of modal characteristics for structural parts during their dynamic exploitation regime. Hereby, it can be included both into the modal experimental/operational analysis domain—with application in dynamic state evaluation in order to provide essential information to vibration control measures, and into the structural health monitoring area—providing a feasible tool for compiling the referenced state and estimating the failure imminence. The analyses were developed based on the laboratory setup, taking into account a simple structural element with constant mechanical and geometrical characteristics. The theoretical approaches contain both analytical evaluations, and computational simulations with the help of the finite element method. The results comparison between the classical modal identification techniques and the proposed method reveals an improved capability of the last for modal characterization of a singular structural element within its dynamic evolution, also taking into account that the number of experimental measurements was constantly maintained. Future developments will take into consideration the applicability of these assessments for structural ensembles or variable characteristic elements.